Each month the James J. Hill Center interviews entrepreneurs for the Startup Showcase feature in the Pioneer Press. See interview as seen in the Pioneer Press Startup Showcase originally posted on December 29, 2018. City of Birth: Billerica, Mass. A. I’m an accomplished software entrepreneur focused on emerging technologies. I’ve been building tech, fixing problems and working down in the trenches on software projects for over 20 years. My background is both on the technical side as a programmer, analyst, and executive technical leadership; and, on the UX side (user experience) — from work leading the design of sites for companies like Target, 3M and the Mayo Clinic. In 2016, I built a very successful app for migraine sufferers. And, now I’m pivoting to a second app that’s a lifelong, consolidated health record where people own their own data. That’s my new company, Healy. A. Healy is a suite of applications to help patients better manage and understand their health. Our first product, Migraine Insight, has a 5-star rating in the app stores and has been used by over 4,000 users. This app is a migraine manager and analysis tool that helps people track and find pain triggers. Healy’s suite of apps, in development, will include tailored experiences for several conditions including Chronic Pain Insight, Fibro Insight, Asthma Insight and a gastro condition tracker. The communities that emerge on these apps will become the user base for the Healy Health Manager, a lifelong patient health care management app with a universal health record. The Healy Health Manager will use a blockchain to build wealth for patient communities. See the executive summary on healy.io for the larger vision of where the company is heading. A. I’ve been developing emerging technologies for 20 years. With decentralization and blockchain, I’ve never seen a bigger excitement level with the tech geeks. All sorts of emerging technologies get hyped. But, watching decentralization begin to emerge, I knew I had check it out. When I did, and realized the potential, I knew I had to pivot into it. With decentralization, I saw an opportunity both to empower people to better manage their health and to shift the economic power of patient communities at the same time. A. We can finally break patients, doctors, and researchers out of the constraints set up by the current monopolistic, broken health care systems. It’s now possible to have people truly own their own data and shift that economic power to patient communities. That radically shifts the game in how software and systems are created for the health care experience. We can now give patient communities and patients themselves a voice they haven’t had before in their health care journey. A. The biggest hurdle? Overcoming the blockchain hype. There is a lot of misinformation. But, as a base technology, it does have a lot of power to change the economics of the world around us. Just as the internet gave us instant access to information and removed the need to go places to accomplish many things, blockchain is going to re-create how we exchange value with one another. And, that’s big … really, really, big. A. I’ve spent half my career coding, leading coding teams, or heading up technical architecture. The other part of my career has been steeped in UX leadership, either helping executive teams develop user experience departments or developing user-focused methodologies within corporations. A. Migraine Insight is an amazing trigger finder. I applied for a patent on the ranked correlation engine that sorts through and finds a single individual’s health triggers. And, the code was interesting to write. I’m proud of that code. A. Unfortunately, the blockchain space got “hot” and attracted a lot of scammers and people who want to do good but don’t know what they are doing. A ton of good is going to emerge with public decentralization and blockchain efforts. But, for us to be successful, it’s important to be weary of being dragged down when the bubble bursts on the scammer blockchains. It’s like the tech crash in the early ‘00s. Same phenomenon. It’s important to realize that as all the hype and shenanigans are dying off — that’s a good thing for the core technologies that are getting it right. A. Self-funded. And, now, revenue. VC is a very hard path for a solo female founder. I’ve been told by every experienced woman I know in tech that the only way I’ll get funding is to hire a male CEO. I’m not willing to do that. So, rather than likely waste time, effort and money going after funding, I’ve just been evangelizing to strategic people I want to hire and offering equity. And, building the tech myself. A. Having over a million users total on the apps. And having that user base drive the expansion of the Healy app into public good. 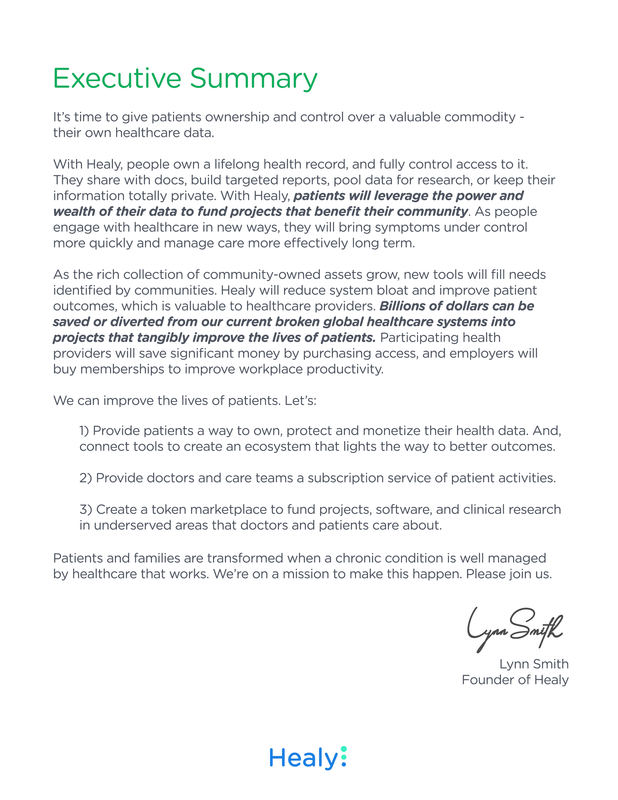 Have the Healy blockchain become the foundational public blockchain for health care. 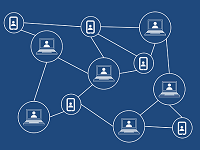 A success will be when the blockchain has enough use and data collected that patient communities can monetize their data in pools (anonymously) on the open data market. A. A combination of experience and persistence. Willingness to listen, learn and re-navigate your plans. The ability to politely ignore people when they tell you that you can’t do what you’re about to do, or that you can’t do something you’ve clearly already done. Also, knowing when to heed true caution when it should be applied. A. Helping patients and their communities gain health and economic power drives me. I come from a health care family. I want to see people and communities thrive. Right now, our health care system is incredibly broken. Shifting the underlying economics as well as giving patients and their communities better software to manage their own interactions with the health system — that’s going to change our world. A. 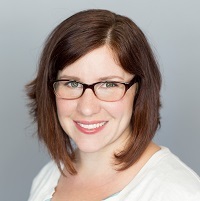 1 Million Cups St. Paul helped me practice and refine my pitch. To me, Healy’s path is very clear. But, it is complex. And hard to talk about. So, this was very helpful to me. I got great feedback.